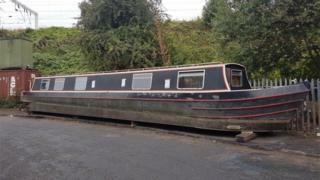 A barge was left abandoned on a street, leading to a social media search for its owner. Council workers were mystified when they discovered the narrowboat dumped in Smethwick, West Midlands. The boat has been in Vittoria Street, near the Birmingham Canal, for about a month, according to neighbouring businesses. After a social media appeal and further investigations, Sandwell Council said the owner had been located. Sandwell Metropolitan Borough Council's highways team had tweeted: "Is anyone missing a barge? "This one has been left in Smethwick, our wardens are working to find the owner as we need to get this moved." However, it later said the owner had now been traced and must "get it moved". David Hosell, the council's highways and environment cabinet chief, said: "Our wardens have investigated this and have found the person responsible for the boat. "We are asking them to get it moved as quickly as is possible."